Drawing with Christopher Hart, 9781640210318, 144pp. 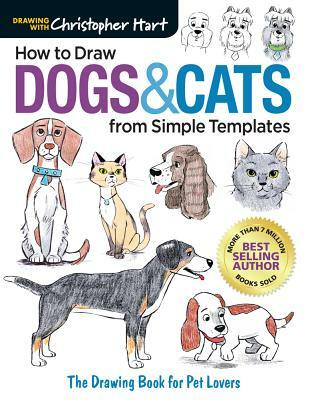 Learn how to draw your favorite furry friend With Christopher Hart's simple templates, any pet owner can do it. Whatever your pet, you can capture it in a beautiful drawing Chris Hart, the world's bestselling art instruction author, has created templates that work for pups and kitties of just about any shape and size--from poodles, dachshunds, and Bernese Mountain Dogs to tabbies, Persians, and Siamese cats. Every template is easy to follow so you'll get adorable results worthy of framing . . . no matter what your skill level. Christopher Hart is a bestselling author who has taught millions of people to draw with his clear and friendly step-by-step approach to art instruction. With more than seven million copies of his books in print, he is the world's leading author of art instruction books. His titles frequently appear on the Bookscan Top 50 Art list. They also have a huge international audience, having been translated into more than 20 languages. In his more than 50 titles, Hart offers artists accessible, generously illustrated, and clearly written step-by-step instruction on a wide variety of how-to-draw subjects, including manga, figure drawing, cartooning, comics, fashion, and animals. He lives in Westport, CT.